Definition at line 312 of file CLReactionGlyph.h. Definition at line 674 of file CLReactionGlyph.cpp. Definition at line 680 of file CLReactionGlyph.cpp. Definition at line 688 of file CLReactionGlyph.cpp. References addMetabReferenceGlyph(), C_INT32, CLGlyphWithCurve::mCurve, and CLGraphicalObject::setModelObjectKey(). add Glyph to reaction glyph. The reaction glyph takes ownership of the glyph. Definition at line 753 of file CLReactionGlyph.cpp. References CCopasiVector< T >::add(), and mvMetabReferences. Referenced by CLReactionGlyph(), CCopasiSpringLayout::createLayout(), CLayoutInitializer::createReactionGlyph(), operator=(), and CCopasiXMLParser::MetaboliteReferenceGlyphElement::start(). Definition at line 351 of file CLReactionGlyph.h. This method writes the information of the COPASI layout object into the corresponding SBML object layoutmap contains a map from COPASI layout objects to libsbml layout objects. the exported metab reference glyphs will be added. Definition at line 769 of file CLReactionGlyph.cpp. References CLGraphicalObject::exportToSBML(), CLMetabReferenceGlyph::exportToSBML(), CLCurve::exportToSBML(), CLGraphicalObject::getModelObject(), CLGlyphWithCurve::mCurve, mvMetabReferences, and CCopasiVector< T >::size(). Definition at line 338 of file CLReactionGlyph.h. Referenced by CLayout::calculateBoundingBox(), CLayout::CLayout(), CQConnectionGraphicsItem::CQConnectionGraphicsItem(), CCopasiSpringLayout::finalizeState(), CCopasiSpringLayout::findCompartmentForReactionNode(), CLLayoutRenderer::getObjectsAt(), CLLayoutRenderer::getObjectsInBoundingBox(), CCopasiSpringLayout::getPotential(), CCopasiSpringLayout::randomize(), CCopasiXML::saveLayoutList(), CLLayoutRenderer::setDeduceSpeciesReferenceRoles(), and CLLayoutRenderer::update_associations(). Definition at line 341 of file CLReactionGlyph.h. Definition at line 759 of file CLReactionGlyph.cpp. References CLGlyphWithCurve::moveBy(), mvMetabReferences, and CCopasiVector< T >::size(). Definition at line 724 of file CLReactionGlyph.cpp. 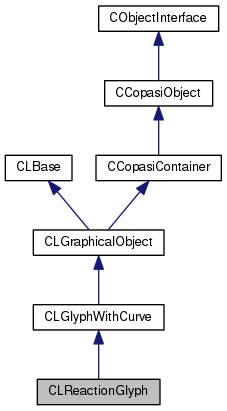 References addMetabReferenceGlyph(), mvMetabReferences, CLGlyphWithCurve::operator=(), and CCopasiVector< T >::size(). Definition at line 842 of file CLReactionGlyph.cpp. Definition at line 824 of file CLReactionGlyph.cpp. Definition at line 315 of file CLReactionGlyph.h. Referenced by addMetabReferenceGlyph(), exportToSBML(), getListOfMetabReferenceGlyphs(), moveBy(), operator<<(), and operator=().